Lemon verbena originates in South America where it grows as a perennial bush. Its leaves has one of the finest lemon scents of all plants - extremely fresh, sweet an fruity. It was introduced to European gardening in the 17th century by Spanish explorers who brought specimens back from Argentina and Chile. 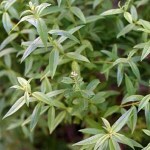 Only 100 years ago, lemon verbena was a common ornamental in European gardens, but today it is rarely planted. The herb's culinary merits have also fallen almost into oblivion. The dried leaves (picture on the right) are marvellous for potpourri mixes. 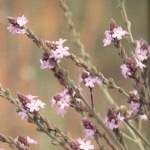 Lemon verbena has been cultivated in southern France for perfumery use. The essential oil is used in high class perfumery as an outstanding citrus fragrance. 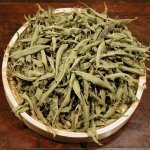 Its major components are citral (geranial/neral, ca. 40 %) and the corresponding alcohols geraniol/nerol (ca. 10 %) . Etymology: Lat. Aloysia, from Herba Louisa, as it was named after Princess Louisa of Parma, wife of King Carlos IV of Spain; Lat. triphylla, 'with three leaves', referring to the arrangement of the leaves on the stem. In France it is called Verveine citronelle or Verveine odorante.